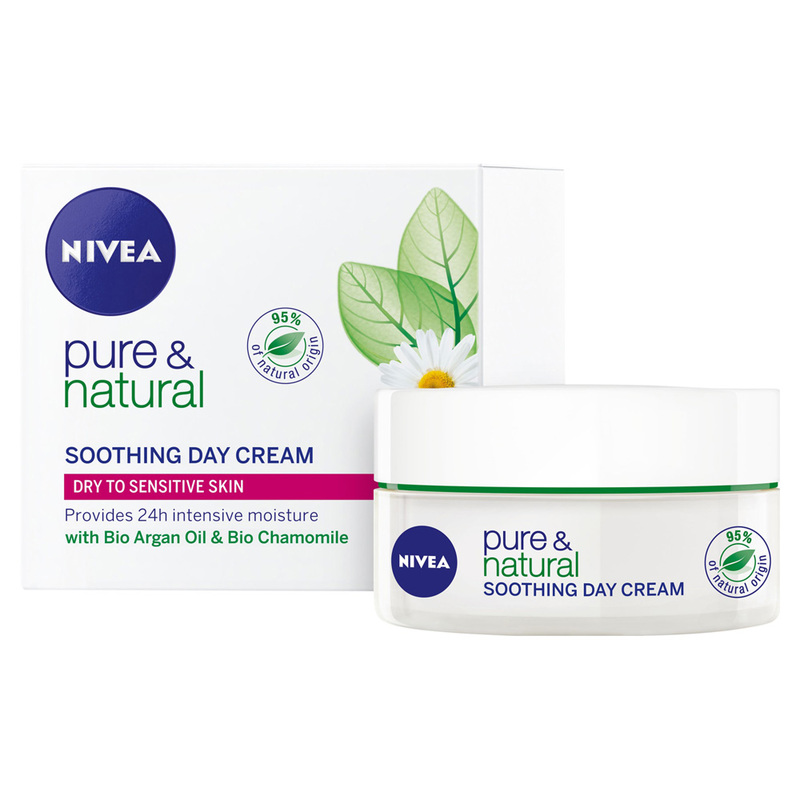 NIVEA Pure & Natural Soothing Day Cream is a moisturiser that provides 24-hour soothing moisture to enrich the skin and offer a natural glow. Ninety-five per cent of ingredients are of natural origin, including bio argan oil and bio chamomile. The product is free of parabens, silicones, colourants and mineral oils. Retailer Stockists: Chemist Warehouse, Priceline & Selected Pharmacies. This day cream is super affordable and does a good job of protecting my skin throughout the day. A little bit goes a long way, and it's easy to spread and it absorbs in quite well. My face always ends up feeling soft and moisturised, and I don't get dried out. It also doesn't react with my sensitive face which is wonderful. It would be good if there was SPF though. I like thicker rich creams and for me the consistency is perfect. It absorbs quickly and moistures for a good few hours. It's normally stored at home so I wouldn't reapply throughout the day but on weekends I do (not that it's really needed but I really like the feel). I was going to say it's great for winter but I take that back - this is great for summer too! Moisture yet soothing. Great for its price! The packaging also allows for use of all of the cream, it annoys me when stylish impractical packaging is used and some of the product isn't reachable! Too bad it doesn't come in travel size! Then again it's not huge either. Would definitely recommend you at least try it. Dry skin, irritated, sensitive in all weather conditions! Loved It The Moment I Tried It! This is a great product to have and it’s quite compact. I find it easy to fit in my bag and I can use it as a hand moisturiser too when I'm at work or just out and about. I fell in love with it the moment I tried it on because it feels so smooth, It also does an incredible job for multiple purpose for rough heels and elbows while still working wonders to soften my face! A little of this product is often all that's needed for your face and neck. Extremely affordable with great results. Apply Sparingly as little goes a long way! I use NIVEA Pure & Natural Soothing Day Cream when my skin is feeling inflamed or hot to touch because it is soothing and cooling when applied. It absorbs into my skin very easily and my skin feels nourished after using it. My skin feel refreshed after using it. It doesn't contain SPF so I only wear it if I am going to be indoors all day. It is incredibly soft and silky to touch and glide across my skin easily. Very little scent/fragrance (if any). I love the glass jar because I can put it in the dishwasher & repurpose it. This cream leaves me with a feeling of greasiness from time of application to wear afterwards through my activities. For me, it doesn't work well with my skin. The smell unfortunately reminds me of cleaner products rather than elegant skin care. The cream smells really great and is very lightweight yet moisturises really well leaving skin soft and fresh. Good for very dry skin! I used to have flaky, peeling skin all over my face, no matter what moisturizer I used. I then switched to this day cream and my face is so smooth and velvety. I've gone through about 2 jars in 6 months of using the cream with heavy daily application. It can sometimes appear a little oily for around 5 mins after I put it on, however this soon soaks into my skin. It works well under sunscreen as well. Do not use large amounts of the cream if you don't need to. NIVEA Pure & Natural Soothing Day Cream is very much like the Moisterising Day Cream variant but this comes housed in a glass tub with the light pink lid. Containing soothing chamomile and being free of parabens, silicones, artificial colours and mineral oils are what makes this cream attractive. However, like all the other products in this range, the cream has quite a strong almost soapy-like scent which lingers on the skin. I couldn't get past the scent and found it to be quite off-putting. This is the one major negative I had with this cream. The strong scent was something I had not expected from a range that claims to be pure and natural. This cream is a bit thicker than what I like for my day cream to be and I find that it leaves my face feeling sticky and looking a bit shiny. I would say it's best suited for those with normal to dry skin or winter time. Overall, it was a below average cream for me. I did not notice major improvements in my skin and therefore only give this 2/5 stars. i really like this day cream - It's my preferred one over the Pure and Natural daily moisturizer also by Nivea. It's lighter on application, you only need the tiniest bit of product, and my face stays shine free for much longer than other moisturizers I've used. the smell of the entire range is really nice and subtle and this product in particular has a lovely scent. i liked the consistency of this cream.... glides on beautifully and absorbs well. I felt a slight residue feeling whilst wearing it.... but not too unpleasant. i found it soothing to wear after a day in the sun getting slightly burnt! although i loved that this product is mostly natural.... i do prefer to use day creams with a SPF factor. im not a fan of applying multiple layers of products to achieve this. I found this product to be a great way to reduce any redness or blemishes on my skin easily and while moisturising. The packaging was amazing, easy to transport, open and use the right amount every time. The consistency of the cream is great, it's not runny so it's super easy use and smells good but not too strong. It left my skin soothed, moisturised and not at all greasy which, is important to me because I can get some pimples. I would buy this product for sure!! I actually didn't notice a huge difference between the 3 different moisturisers in the range on my combination skin type. I found they all sunk in reasonably well, taking about 5 or so minutes to absorb. They all come in glass jars, which is a pet peeve of mine - I hate sticking my fingers into pots!! After an hour or so my skin felt really greasy, which has never happened with any other moisturisers I've used. It is also a shame that the day creams do not contain SPF. Lastly I cannot stand the fragrance. These are the most highly fragranced skincare products I have ever used and I couldn't stand it. There are definitely better options in nivea's skincare range. this is an average moisturiser out on the market for dry skin, i gave this to my sister who has really dry skina nd she really liked it! its got soothing properties and feels very nice on, but is quite thick. although she says it absorbs pretty well! I really liked the sensitive day cream in comparison to the moisturizing day cream, I felt like this product worked wonders on my skin and left my skin feeling supple and smooth. I loved wearing it under my makeup as I t absorbed into my skin quickly and easily and made a perfect base before I applied my foundation. Sadly I will not be switching my current day cream for Nivea visage's offering simply because I wish to avoid signs of aging and this product's lack of SPF 15-30 is concerning to me. Aside from this I was very pleased with the texture and smell of the product- it felt luxurious! it feels soft and baby smooth on my face. I regret that this product is rendered irrelevant to me through the lack of sun protection, regardless of the value that the natural ingredients provide. This cream seemed to be a bit lighter than the other creams in the same range but still more heavy than one would like it t be. Nonetheless my skin felt soft and moisturised, although I wasn't overwhelmed by the product's result. This cream was my favourite out of the three. Unlike the others it didn't seem to be too heavy for my skin. The Chamomile was extremely soothing as I am prone to skin irritation and eczema. The 95% natural origin products gives me more confidence in this range on being gently on my skin. The cream applies easily and is quickly absorbed leaving my skin feeling soothed and moisturised. The glass jar is great to see how much product is left and like the others it had a safety foil attached. Unlike the photos of the Nivea Pure range on here, the lids aren't different colours making it hard to distinguish quickly which lotion is which. Coloured lids would be great. A pump pack would be more hygenic to use though *hint hint* Nivea. I absolutely love the presentation of this product it reminds me of a high end product! This product made my skin feel a little softer, the more I used the product the more I could see the improvement in my skin though I did find it a little thick in consistency. You only need to apply a little amount to cover your whole face. I love how Nivea has made a range pure & natural as the name itself I do believe these products are also better for your skin as it uses less chemicals on the skin. Would recommend to people that have sensitive to normal skin. The smell of the product is very nice and not overpowering which is a pro! Though I wish the jar was a little bigger, but it is a very good price for the amount you are getting in the end. What are the benefits of the Nivea Pure & Natural range? Are these ingredients the answer to naturally glowy skin? Three of the best natural ingredients for a hydrated, smooth and youthful complexion… Brought to you by beautyheaven.com.au.